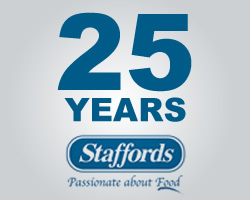 In 1987, the Staffords brand made its first appearance in the market and now, 25 years later, is acknowledged as one of the leading brands in the fine foods industry. Whenever you choose any one of the 40 products carrying a Staffords label, you know you’re choosing the best. The Staffords brand continues to take huge strides in ensuring only the finest quality ingredients are used to make each product perfectly delicious. Nothing quite matches up to Staffords condiments to turn a great meal into a gourmet experience. Just the thought of how Staffords Sauce Tartare lifts fish and chips from the humdrum into a delight, and how traditional roast turkey, pork or beef takes on exotic flavours when paired with Staffords Redcurrant Jelly, Mint Sauce or Horseradish Sauce, literally makes your mouth water. And, of course, Staffords Smooth Dijon Mustard is the finest France has to offer. When you want to add a zesty touch to change a meal from super to superb, Staffords VIP Sauce puts the traditional English brown sauce into a class of its own. And among the other Staffords food enhancers sought by people whose tastes are discriminating, only the best will suffice, Staffords Capers in Vinegar, Balsamic Vinegar and Gravy Browning. From serious eating to titillating the taste buds with the fun of baking, Staffords has remained in the lead, keeping up with the demand for ever new and exciting ideas. The Staffords baking range include: Staffords Milk Chocolate Disks, Dark Chocolate Disks, White Chocolate Disks, Chocolate Vermicelli, Rainbow Vermicelli and Chocolate Chips. What’s more, all Staffords baking products are both Kosher and Halaal. Stafford Bros & Draeger, who have been around for 91 years, are proud to be the manufacturers who conceptualized the exceptional Staffords brand and look forward to continue innovating and creating fine products for the next 25 years. If you’re planning any kind of celebration this month, make your food even more memorable with Staffords. In fact, any day you use Staffords, makes it an occasion to remember. The range of Staffords products is available from all leading supermarkets and retail outlets. In case you haven’t yet tried all of the six hugely popular Staffords baking goods, they are: Staffords Milk Chocolate Disks, Dark Chocolate Disks, White Chocolate Disks, Chocolate Vermicelli, Rainbow Vermicelli and Chocolate Chips. What’s more, all Staffords baking products are both Kosher and Halaal. The range of Staffords baking products are available from all leading supermarkets and retail outlets. Pop any Staffords baking goods into your shopping basket and make magical cupcakes this season.